This is not a recipe you will serve when watching calories, but they sure do taste good! My husband and I love eating baked sweet potatoes in their shells with only a little butter, cinnamon and brown sugar, but this recipe is just a holiday dish. 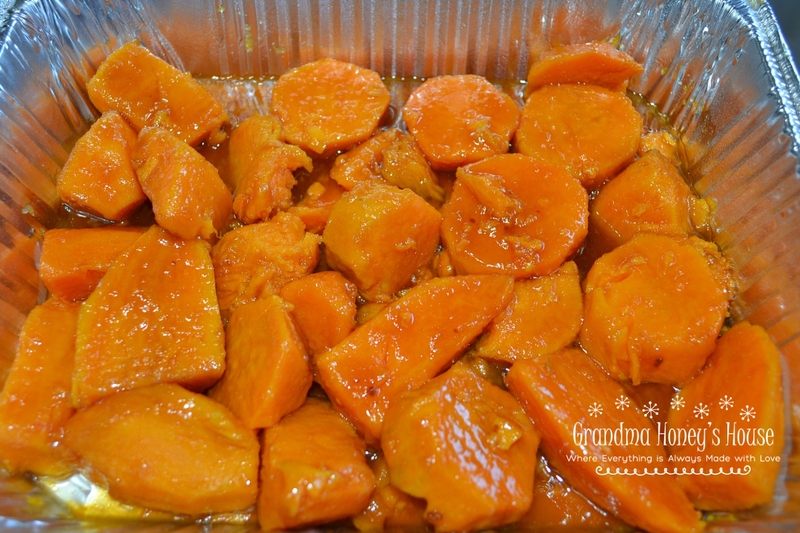 My son-in-law had never liked sweet potatoes, but after having my mom’s recipe at Christmas one year, he was converted. I like to use disposable aluminum pans when taking these to a covered dish dinner, so excuse the baking dish. 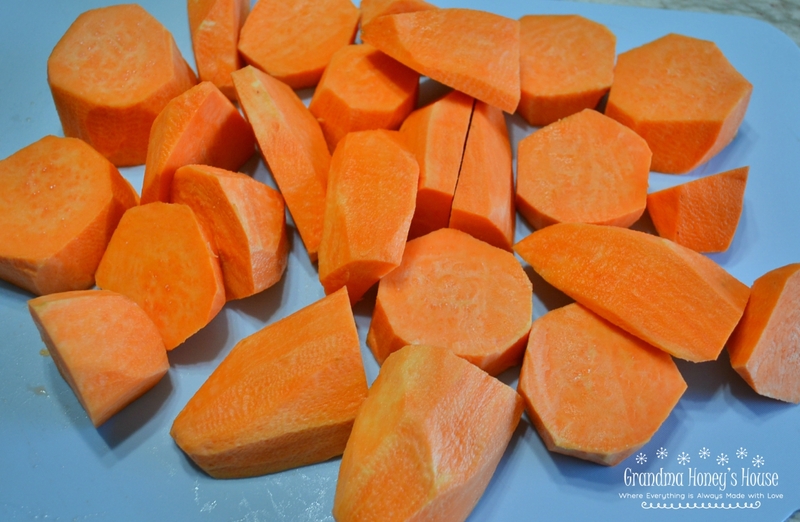 Start by peeling and washing your sweet potatoes. Cut into different sizes. Place in a large saucepan, cover with cold water, and cook until slightly tender. Drain water. In a large saucepan, melt butter and stir in the brown sugar and cinnamon. Add the potatoes and fold into the syrup. You may also place the potatoes into the baking dish and pour the syrup over potatoes if you prefer. 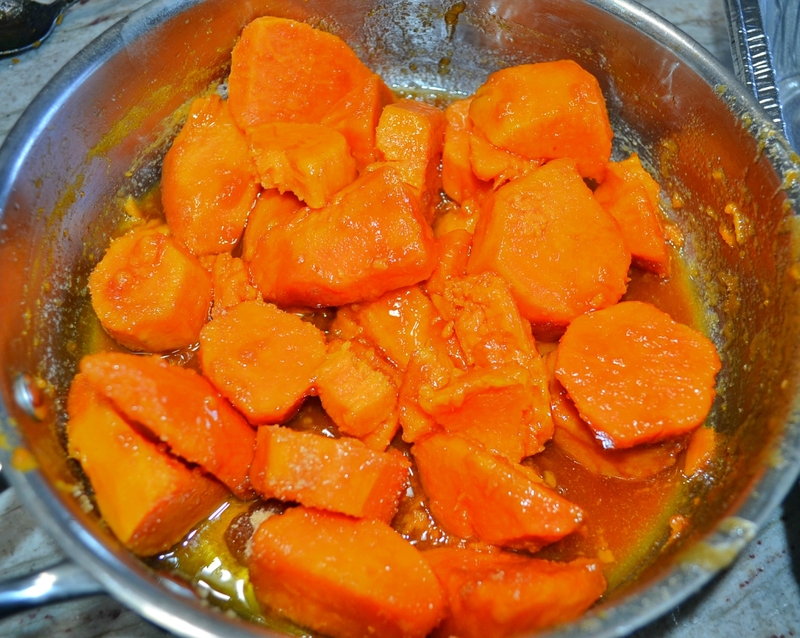 If you are making a large amount of sweet potatoes, the pan with syrup may be too heavy. sprayed with no stick cooking spray. Cover with aluminum foil and bake 15 minutes. Remove foil and continue to bake another 30 minutes. Peel and wash potatoes. Cut into variety size shapes. Place in large saucepan, cover with cold water, and bring to a boil. Reduce heat to medium and cook until potatoes just become tender. Remove from stove and drain water. In a large saucepan, melt the butter. Whisk in the brown sugar and cinnamon. Cook over a medium-low heat until mixture starts to thicken. Remove from stove. Fold potatoes into the syrup to coat, place in baking dish. May also place potatoes in baking dish and pour syrup over them. Preheat oven to 350 degrees F. Cover with aluminum foil and bake 15 minutes. Remove foil and bake an additional 30 minutes. These baked sweet potatoes can be prepared a day ahead of time and baked on the day you need to serve them.